As we all join the nation to celebrate the 35th birth anniversary of His Majesty the King today, I would like to take this special opportunity to offer my wishes and prayers to His Majesty the King and his family. We are extremely blest to have such a dynamic king to guide us hand-in-hand through the wilderness of time. Ever since His Majesty ascended the golden throne in 2008, he has taken numerous initiatives, all for the wellbeing of his subjects. The way he regularly interacts with youth, teachers, farmers and all other segments of the society shows how much he cares for us and how much he is concerned about our wellbeing. The political parties will come and go, but he will be the ultimate symbol of our national unity and sovereignty. He has been the main source of inspiration for us and we have no appropriate words to express our gratitude for what he has done for us so far. 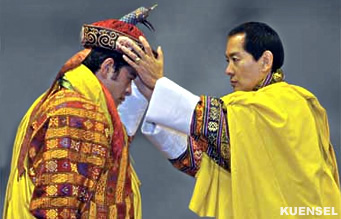 While some countries in the world are struggling to overthrow dictatorship and their autocratic governments, we in Bhutan are enjoying absolute peace and harmony with the blessings of our far-sighted and kind-hearted kings. His Majesty always loves to mingle with his subjects wherever he goes and see for himself the conditions of his people. So far, he has granted land Kidu (charity) to a significant number of landless people, citizenship to those with no proper census records and financial support to the economically disadvantaged people in the country. Unlike most political leaders of other countries, His Majesty knows well about the needs and conditions of his people and all the initiatives he takes are directed towards promoting the general wellbeing of entire Bhutanese society. There’s no doubt that His Majesty the King is a very humble person by nature. He had pledged in his first national address that he will not rule us as a king. Rather, he would serve us as a father, brother and son. Today, we are extremely pleased to see him doing exactly what he had said and it truly makes us feel fortunate to be born in such a heavenly nation. Only a true Bhutanese will realize how much we owe His Majesty the King for the undisturbed social harmony and political stability which we enjoy all the time. On this auspicious occasion, I would like to heartily wish Your Majesty the King a very happy birthday. May Your Majesty and the whole Royal Family continue to be blest with everlasting peace and happiness and may we continue to shine as a nation under your sacred leadership and guidance. Long live Your Majesty and your family!